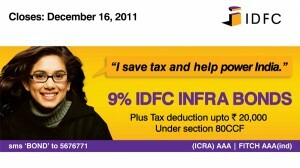 IDFC is once again out with infrastructure bonds – IDFC Tax Saving Long Term Infrastructure Bonds. You can invest in the same upto Rs. 20,000 to save tax. Below are the details of the same. These bonds have got the highest credit rating of (ICRA) AAA by ICRA and Fitch AAA (ind) by Fitch. Minimum number of bonds per application Two bonds and in multiples of one bond thereafter. For the purpose of fulfilling the requirement of minimum subscription of two bonds, an applicant may choose to apply for two bonds of the same or different series. Interest Rate 9% p.a. N.A. Investors can mortgage or pledge these bonds to avail loans after the lock-in period. An investor would need a PAN card to invest in these bonds. Should you invest in IDFC Infrastructure bond 2011? Rate of interest for PPF is 8.6% while in IDFC Bond you can lock-in your investment for 10 years at 9% interest. 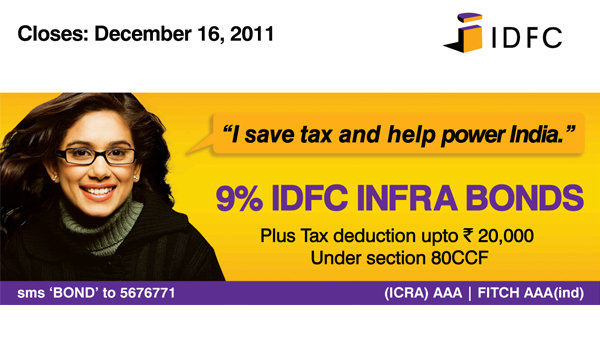 I think its the right time to invest in IDFC Infrastructure Bonds 2011. Your returns would depend on the tax bracket you are. For details on the same Click here. I think its a decent return and its recommended to lock-in in such tax saving instruments at this high interest rate period. I suggest everyone in the higher tax bracket to subscribe to the Infrastructure bonds. You may subscribe to this IDFC bond or wait for other institutions to issue these kinds of bonds. But by the end of this financial year you must opt to save tax on additional Rs 20,000! HDFC Bank Ltd. IndusInd Bank Ltd.
ICICI Bank Ltd. Dhanalakshmi Bank Ltd.
IDBI Bank Ltd. ING Vysya Bank Ltd.